Many new works will be shown from oil painters Dave DeMatteo and Dirk Foslien, along with pastelist Joe Mancuso. Also included are two original watercolor paintings by Merv Corning and a serigraph work by Eyvind Earle from a private collection. 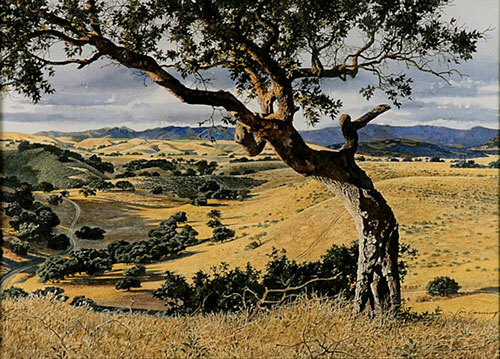 A long-time gallery favorite is artist Dirk Foslien, known for his renditions of the Santa Ynez Valley, especially those with poppies. His works are completed in the Old Masters style and techniques learned in his study with the Muse Academy of Fine Art in Baltimore, MD. Foslien often enjoys spending the day in the gallery demonstrating and talking with visitors. He has been part of the gallery for over 20 years. New works from Dave DeMatteo celebrate his favorite sights here in the valley, including the Figueroa Mountain range and the sweeping valley vistas. Intensifying and diminishing light to a delicate balance, DeMatteo captures the essence of the Santa Ynez Valley’s many moods, hues, and patterns dictated by the season and time of day. Two watercolor paintings recently acquired by the gallery are by Merv Corning, who passed away in 2006. These two artworks are of the Santa Ynez Valley and are amazingly executed in his unique, precise style. Corning served in the Merchant Marines until the end of WWII. He had a long career in the art world and was commissioned to complete famous aerial combat scenes, airplanes of WWII and the men that flew them. Other subjects by Corning included National Football League football players, Victorian houses, still lifes, people and landscapes. The beautiful serigraph by Eyvind Earle (1916-2000) adds vibrant color to the exhibit. Earle’s landscapes are remarkable for their suggestion of distances, landmasses and weather moods, and his watercolors of the valley are no exception. A prolific American artist, author and illustrator, Earle also created animated art. He worked for most of the 1950’s at Walt Disney Studios on their animated films and was responsible for the settings, styling, background and colors for “Sleeping Beauty”. Also participating with new works for this opening are oil painters Sheryl Knight, Nancy Phelps and Barron Postmus. The Valley Vistas Exhibit opens June 16 and runs through August. Stop by and enjoy these wonderful landscapes available for purchase.